LONDON--(BUSINESS WIRE)--A well-known market intelligence company, Infiniti Research, has announced the completion of their recent article on trends that will shape the consumer packaged goods industry in the next decade. The article provides comprehensive insights into the key CPG industry trends to expect in the future and explains how companies can adjust their go-to-market strategy accordingly. Over the past few years, there has been tremendous and thrilling growth in the global consumer packaged goods (CPG) industry. Several top companies in the CPG industry have been successful in launching innovative products to meet an ever-growing array of customer needs and desires. Although the industry has witnessed increased margins and improved portfolios toward fast-growing categories in the last decade, the next few years for this sector will be dominated by tremendous changes due to the upheavals in global consumer and supply markets. Emerging countries in Asia including China, India, and Indonesia currently have a significant share of growth in the global CPG market. This share is expected to show a rise over the next decade. As a result, the global middle class will expand dramatically. Technology has undoubtedly played a major role in the growth of the CPG industry. It will be even more disruptive in the future. Companies in the CPG industry will face some major strategic challenges in identifying how to win in this new digital world, this includes finding answers to building a successful business through online retail channels and expanding their brands and categories in a socially networked world. A recent study by the experts at Infiniti Research suggests that over 50 percent of consumers in the US have been driven by the financial crisis to seek more value-based offerings. This shift can have a major implication on the consumer packaged goods industry’s profit formula. Much worse, it could even erode the pricing power of brands. Companies are employing a variety of strategies to address such CPG industry trends. Some brands are rationalizing their price lists to help retailers control SKU proliferation. Others are even riding the shift to value by running joint promotions with private-label brands in adjacent categories. 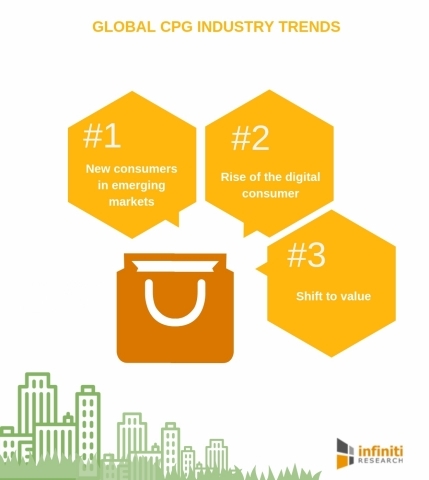 Infiniti Research has announced the completion of their recent article on trends shaping the consumer packaged goods industry in the next decade.